I mentioned last week I’m all about keeping dinners simple, especially during the week, and this salad is as simple as it gets. It literally takes minutes to pull together. I love throwing together a simple green salad to serve alongside grilled meat with veggies or even rice for a balanced and healthy dinner. Arugula is one of my favorite leafy greens, with its strong peppery flavor, and it’s a nice change from other greens such as spinach and kale. 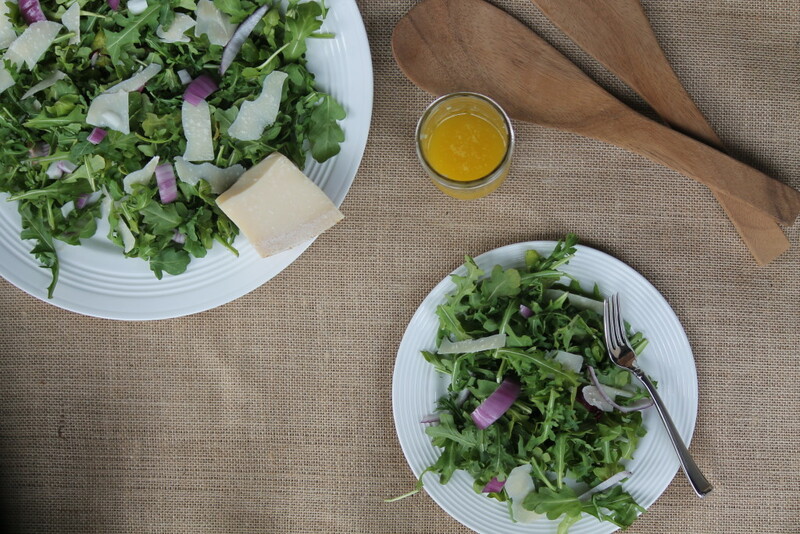 Arugula is loaded with antioxidants and is a rich source of vitamins and minerals. The dressing is perhaps the best part to any salad and this champagne vinaigrette gives this one a nice smooth finish. 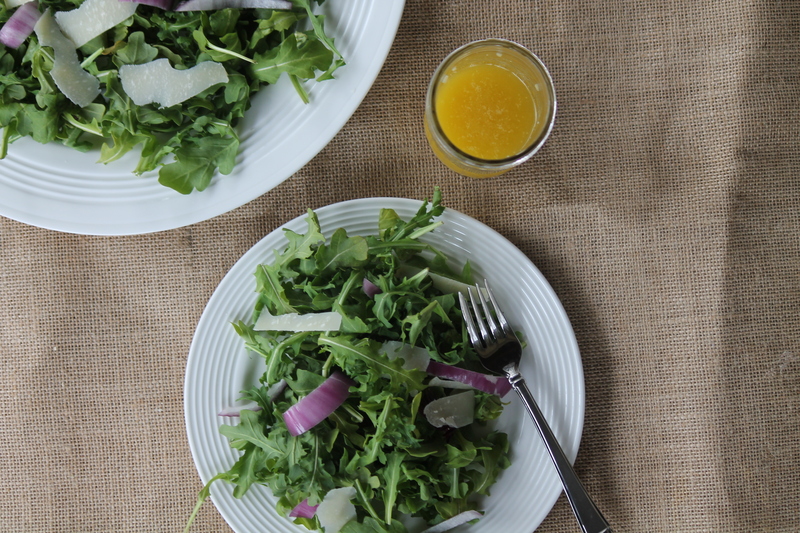 It’s light and flavorful with a touch of sweetness that balances out the peppery flavor from the arugula nicely. This salad is simple, yet elegant enough for a dinner party, and best of all it’s healthy, fresh and flavorful. In a small bowl, whisk together the mustard, garlic, vinegar, and honey. While whisking, slowly add the olive oil until the vinaigrette is emulsified. Store dressing in a jar with a lid. 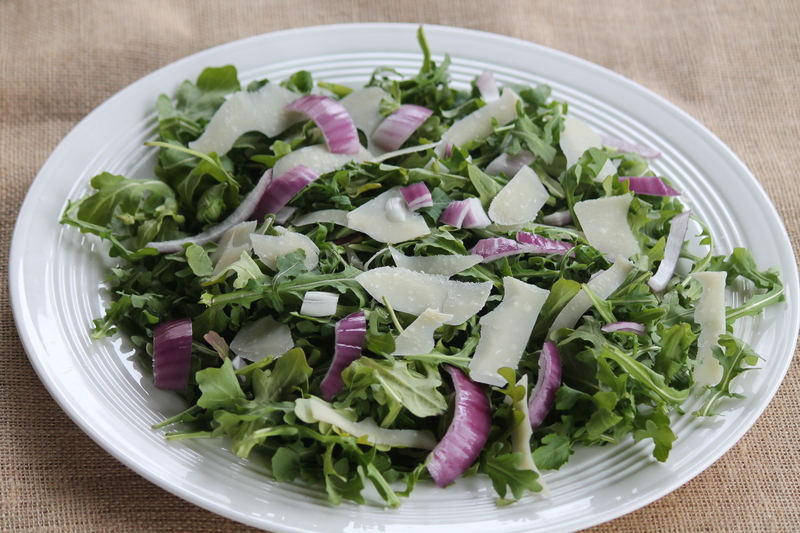 Place the arugula in a large salad bowl. Add in the red onions. Using a vegetable peeler, shave sheets of Parmesan cheese onto salad. Serve salad on to four individual plates. Drizzle with dressing and serve immediately. mmmm perfect Spring time salad! I love all vinegars so I am loving this dressing! I love this salad + dressing! I’m with you. A simple salad + grilled meat or fish makes the ultimate weeknight meal!